Snap Bird is a Twitter history search engine. Simply login using your Twitter account and search yours or someone's timeline, tweets, favorites, direct messages; by user name and/or search term and click the "Find It!" button. PeekYou is a people search site that associates a weblink with an individual. Using a patented technology the site will take a public weblink and try and determine "Who made it?" or "Whom is it about?" Just type in a first/last name or username in the box provided to take a "Peek." Social Buzz is a Real-Time Search Engine for Facebook, Twitter and Google+, providing a brand new user experience for Internet surfers and deep analytics for marketing professionals. The site has multiple keywords, exact keywords, and minus keywords tool, etc. Social Searcher allows you to search Facebook Messages, People, Applications, Music, Video, Groups, etc without logging in. The site also has recent news, app reviews, rumors, and search tips. WebMii is a search engine site where you can search for people by name and/or keyword or search for companies and brands. Find all their online public information and WebMii Score (visibility score) by region using the search box provided. MillionShort is not your typical search engine. It removes the top one million (or less) websites from its search leaving new and previously untapped and undiscovered sites for you to browse. Twazzup is a real-time news /search engine platform. You can follow a real-time stream of a certain topic, find the most authoritative Twitter users tweeting on a given subject, or restrict your search by specific keywords and sub-trends, etc. Yakaz.com A classified ads search engine that claims to have indexed all classified ads on the Web. Listings can be sorted by relevance, price or date. Topsy A new kind of search engine that listens to conversations taking place on the social web. It finds snippets of conversations that match your search and ranks results based on relevancy as well as the influence of the people talking about them. Topsy's first index is based exclusively on Twitter. 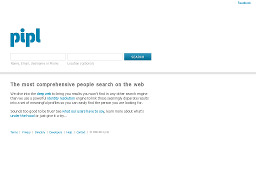 Omgili.com A vertical search engine that scans and crawls online boards, forums and other discussion based resources, analyzing and differentiating between topic, title, replies and discussion date. A very impressive vertical with solid results. Searchbots.net An experimental search engine that allows you to build your own personal search robot to continuously search the Internet and find the best websites in your areas of interest. Picsearch.com Picsearch.com is a search engine for pictures and images with many unique features. Unrivalled relevancy, family friendly, and designed to be simple, fast and accurate. 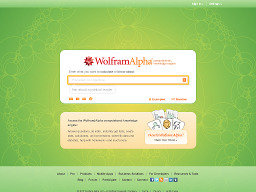 WolframAlpha A computational knowledge engine that provides definitive answers to factual queries. Simply enter your query (dates, figures, formulas, etc.) to receive the answer. Scour Bridges the gap between searchers and relevant results, providing a platform for users to vote and comment on relevancy. Search results include Twitter and Digg realtime posts as well as a search feature that allows you to search a site directly from the SERPs.